Even with this setback, Rainmaker Software was not ready to throw in the towel. Two years after the release of Isle of the Dead, Rainmaker Software finished their sophomore effort: Nerves of Steel. Isle of the Dead fell into obscurity shortly after its release while Nerves of Steel immediately became a practical nonentity in the history books. Due to its poor commercial performance, Rainmaker Software ended up dissolving shortly thereafter. Could Nerves of Steel be considered an improvement over Isle of the Dead – for whatever that is worth? Taking place in the future, Southeast Asian forces have combined to form a massive army. Their goal is world purification – that is, they intend to kill off the entire population of Earth aside from themselves so they may rule over what remains. This is where you come in. As a member of the American elite forces, you have been sent by your superiors to infiltrate their underground complexes and recover information. Unfortunately, you have been betrayed by your contact and are now imprisoned by the forces of the army’s leader: Kim Dung Moon. It’s up to you to escape and prevent the impending holocaust. I haven’t even begun to assess the gameplay and I have already run into a major problem: the plot itself. 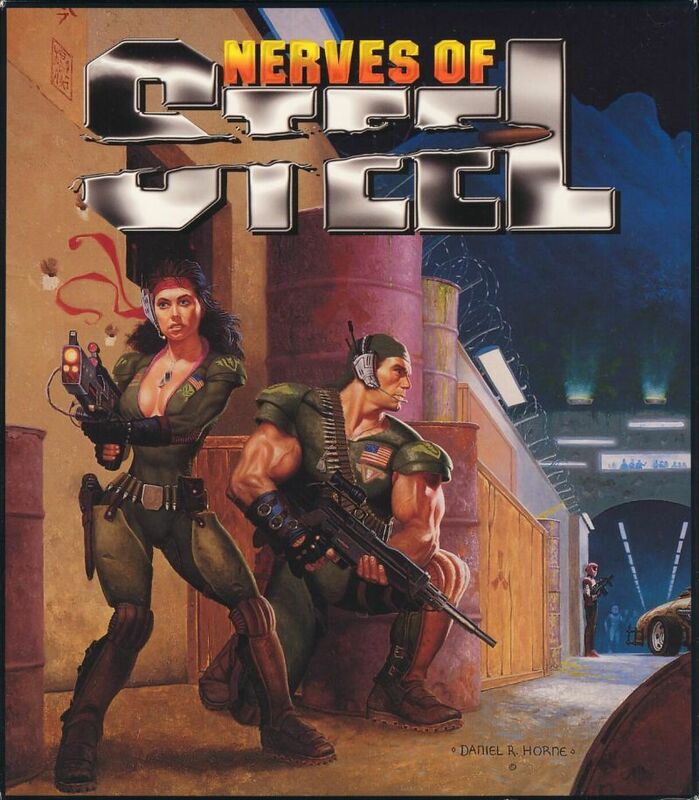 Nerves of Steel operates on a blatantly jingoistic premise. With the story being in the background, it naturally lacks the kind of nuance one would need to make it work. Kim Dung Moon himself is a rather immature pastiche of Kim Jong-Il, the leader of North Korea in 1995. What little narrative there is tries to avoid the issue by claiming the enemies are from Southeast Asia, but it’s not subtle at all. In all honesty, there could have been a satirical comment to be made, but the developers were clearly not ambitious enough to try. Sadly, this mindless premise is the least of the game’s concerns. While Isle of the Dead started off innocently enough before bombarding the player with its nonsense, I am positive that anyone who looks at the following screenshot can gauge exactly what kind of experience they’re in for the exact second the game begins in earnest. I assure you that in no way did I modify the preceding screenshot to misrepresent the game. 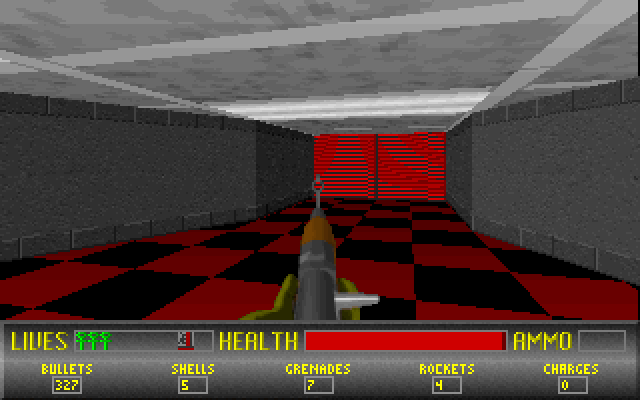 While Wolfenstein 3D made excellent use of its limited textures to allow players to gauge their location at a given time, Nerves of Steel sees fit to drop the player in the middle of an ugly, grey corridor with limited visibility. Though many old-school enthusiasts are quick to claim that graphics do not make a game, the first impression one would get from Nerves of Steel is quickly revealed to be a prelude for what is to come. Indeed, the first indication that you’re not being treated to a quality experience stares at you right in the face from the onset. 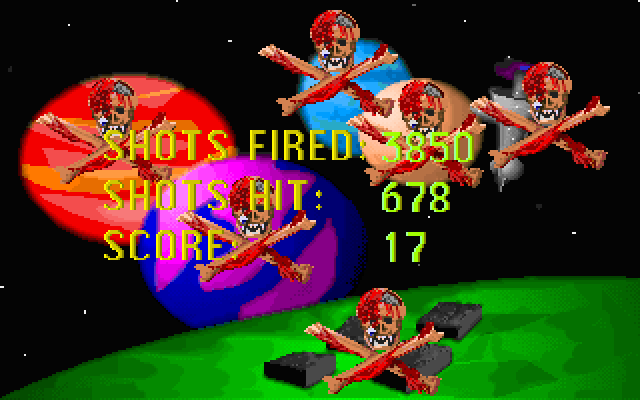 That white shape in the center of the screen is the game’s first enemy. Rainmaker Software, deciding to dispense with the frankly absurd notion of letting players adjust to the controls, placed the protagonist in the field of vision of an enemy. Before the player even knows what is going on, they are already being fired upon. In a competent game such as Wolfenstein 3D, the protagonist would take quite a bit of damage from this merciless onslaught. As an unintentional result of placing an enemy at the very start of the game, the player has the opportunity to learn that the developers couldn’t implement a basic hitscan function properly. The enemy’s pitiful damage output and poor accuracy don’t significantly change whether you’re across the hall from them or breathing down their neck. This does produce an amusing situation in which enemies are incapable of shooting you at pointblank range no matter how hard they try. From this, one could get the impression that the opening narration is grossly exaggerating the threat of the enemy army. In no way do they live up to their reputation of “one of the most deadly armies ever seen by man”. How they have the potential to bring the world to its knees when they’re all apparently equipped with airsoft guns is beyond my comprehension. To be completely fair, Nerves of Steel is a step up in complexity from Isle of the Dead as far as enemy behavior is concerned. After all, in Isle of the Dead, the only mobile threats you faced were incapable of using firearms, depriving them of any ranged attacks. 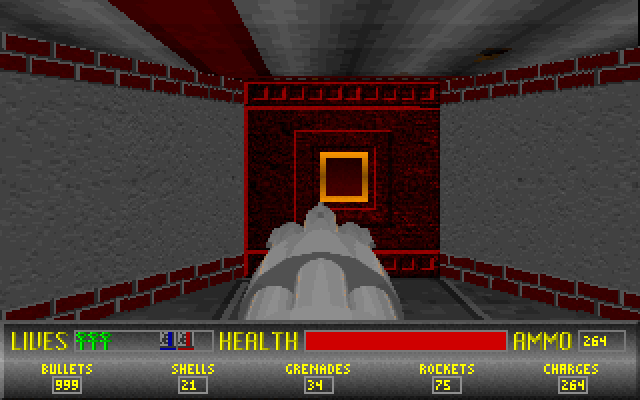 Then again, Nerves of Steel was released in 1995 – three years after the debut of Wolfenstein 3D. Even keeping in mind that it was released in a time in which first-person shooters were called “Doom clones”, Rainmaker Software should have researched how to program a hitscan. Their lack of research and its subsequent effect on the gameplay signposts to a savvy player that not only is Nerves of Steel a horrendous effort, it has practically no chance of redeeming itself – all within the first minute. As impossible as it is to believe, the game’s quality rapidly plummets from there. 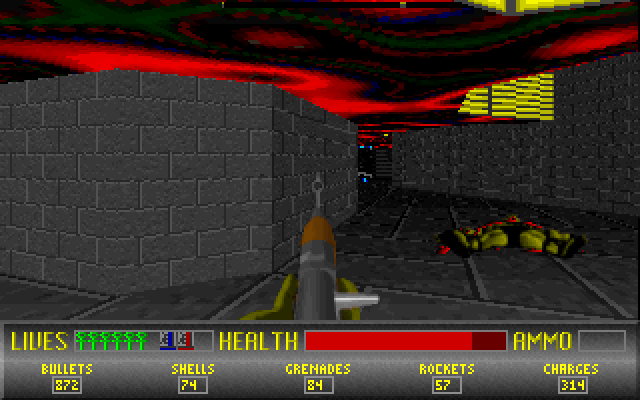 The developer’s inability to program a hitscan is untenable, but somewhat understandable given how new first-person shooters were in 1995. Less understandable is that they evidently couldn’t figure out how to program doors properly. The light-grey texture that vaguely resembles a piece of corrugated metal is a door. Being a door, one would expect the act of opening it entails walking up to it and pressing the action key – in this case, the spacebar. Such an expectation would be giving the developers far too much credit. Doors in this game aren’t doors as much as they are walls with no collision detection. Though this admittedly makes finding secret areas easier, it’s an incredibly lazy design choice. In certain cases, you can cause the textures to not load properly, placing the protagonist in an infinite void. Some are so poorly designed that it’s possible to clip out of the stage by accident. The worst part about how doors function in Nerves of Steel is that there is little very internal consistency. 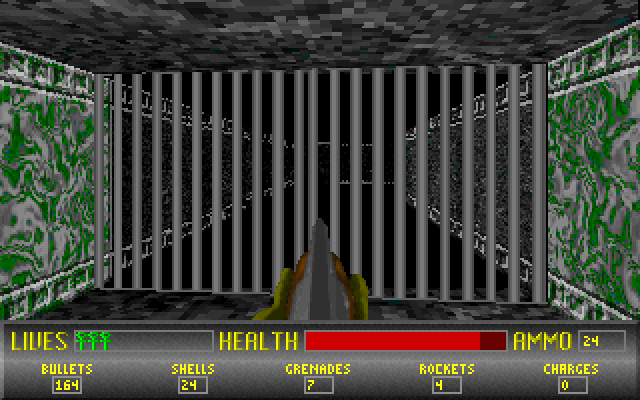 The above screenshot contains a door that requires a keycard to enter. Keys come in three colors: red, blue, and yellow. They are used to open doors of those respective colors. The problem is that the pictured door in no way resembles one. Given that most doors are entered by running into them, I had no idea some required a press of the spacebar to use. You can also open iron bars – though not all of them, for some reason. What’s worse is that the textures themselves have no consistency either. You’ll obtain a matching keycard only to spend a few minutes wondering why it’s not working. After that, you realize you were attempting to open a wall the entire time. This problem is occasionally inverted later when you attempt to enter what you’ve come to accept is the door texture only to realize it’s completely solid. 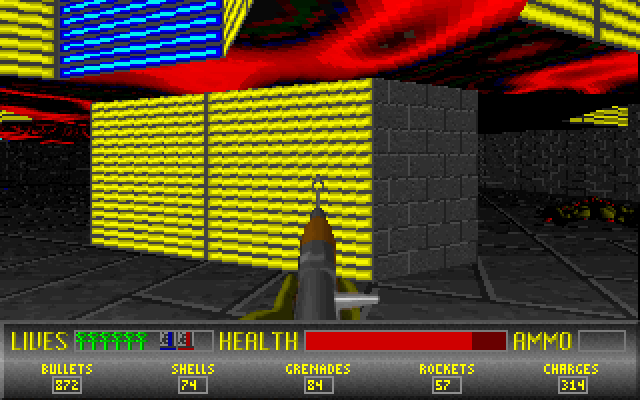 Isle of the Dead was notable for introducing adventure game elements into a first-person shooter. Theoretically, this could have made for an inventive game, combining two popular genres to form a unique hybrid experience. Practicably, Isle of the Dead was an action game that could easily be rendered unwinnable if the player didn’t complete it in the intended order. On the surface, forgoing the adventure game elements that plagued Isle of the Dead would logically result in a perfectly intuitive experience – regardless of its lack of polish. That’s what I thought going into Nerves of Steel, but I was quickly proven wrong when I spent nearly ten minutes wandering around the first stage with no idea how to advance. When watching somebody else’s playthrough, I was positive the person who made the video exploited some kind of elaborate glitch to advance. 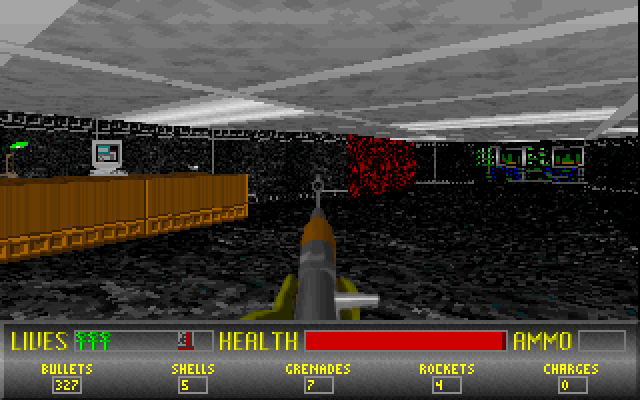 In order to find the game’s first keycard, one has to break one of the supercomputers on the back wall to the right. I feel as though I shouldn’t have to explain why this design decision is terrible because I am positive even those not versed in the medium could spot the problem. Nonetheless, as a critic, I am obligated to do so. 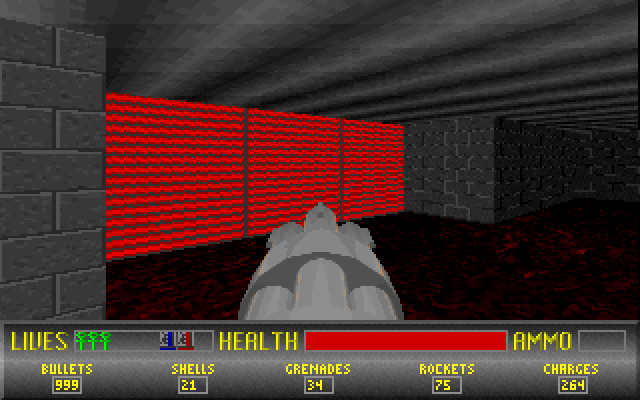 A majority of the players stumbling upon this room are going to assume the computers only exist as a wall texture. Even if one were to deduce that they can be broken, nobody in their right mind would assume the action opens up a secret passageway. Clearly, no such person was a member of Rainmaker Software because that is exactly what happens. You don’t even see the passageway open up; you just turn around and suddenly, the wall is further back than it was a second ago. Anyone blindly playing Nerves of Steel could potentially not catch on to this convoluted cause-and-effect setup and find themselves in similar situations later. Alternatively, if one were to figure it out immediately, it wouldn’t hinder them in any way. Every time they were to see a computer wall texture in the future, their immediate inclination would be to break the computers, hoping that doing so opens up a secret passageway. 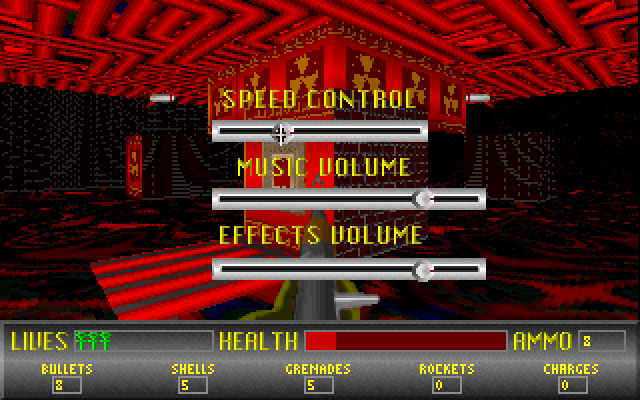 In short, depending the player’s perceptiveness, the computers are either a legitimate hindrance or a pointless diversion. 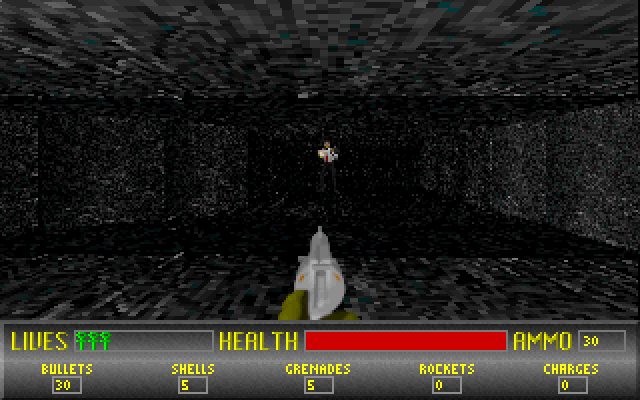 Enemies in Wolfenstein 3D were notable for being able to pursue the character into other rooms, opening up any doors along the way as appropriate. The evil forces of Kim Dung Moon, on the other hand, are stopped dead in their tracks as long as a door exists between you and them. On top of being such poor shots and equipped with airsoft guns, these soldiers also apparently can’t even open the doors in their own base. As if that wasn’t enough, the developers didn’t program basic movement patterns for them. Rather than simply advancing toward you, they seem to phase in and out of existence. Though it may seem par for the course for this game, it’s inexcusable when you realize no such problem existed in Rainmaker Software’s earlier effort, Isle of the Dead. In other words, as dire as they were, Rainmaker Software knew how to program basic enemy movement before apparently losing that knowledge within the next two years. Though the game later pits the player against hordes of mutants and cyborgs, they are not intimidating in the slightest. In fact, the greatest enemy in the game is, fittingly enough, a result of the programmers’ incompetence. That enemy would be the game’s fragile stability. After making significant progress in the game, it began crashing frequently. 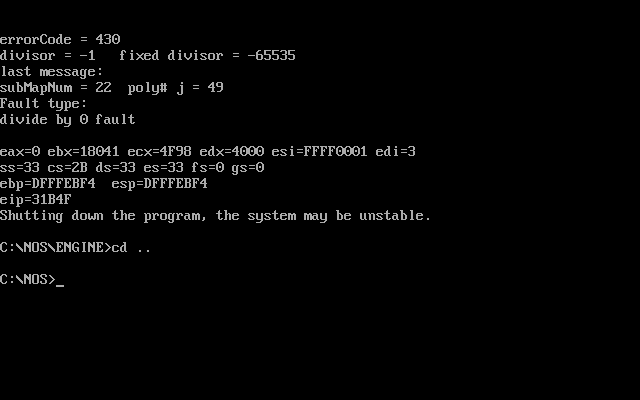 Every single time, DOS attributed it to the same thing: a divide by zero fault. What caused it to crash seemed to vary wildly. Sometimes it happened while I was attempting to shoot down enemies with the assault rifle. Occasionally, it crashed when I stepped on a certain part of the map with no enemies in sight. I suppose in light of this game’s many grievances that Rainmaker Software neglecting to program a basic error handler isn’t surprising, but once again, I feel it’s worth mentioning how none of these problems existed in Isle of the Dead. It is a true testament to this game’s quality – or lack thereof – that one of its lesser grievances concerns its terrible controls. To begin with, attempting to play Nerves of Steel with a mouse is a lost cause, for the game barely registers its movements. I won’t fault Rainmaker Software for this specifically because they made their game before mouselook fully solidified as the standard control scheme in PC first-person shooters. As such, the only sensible way to control your character is with the arrow keys, using “CTRL” to fire your equipped weapon. This is made unnecessarily difficult when you realize even the most subtle taps of the arrow keys cause your character to turn at forty-five degree angles. In addition to making it tricky to hit your mark, it turns the simple act of walking down a linear corridor into an exercise in frustration. There is ostensibly an option to lower the character’s speed. I say “ostensibly” because it doesn’t work consistently. Sometimes, the game will apply the changes right away, but you might have to reload a save file in order to get them to take effect. Even worse is that the game may exaggerate your character’s slow speed, making it nearly impossible to run away from an enemy ambush. As one may have deduced from reading my description of the first stage, the level design of Nerves of Steel can be needlessly obtuse. Admittedly, for a majority of the game, the level design is boring and uninspired. Just like the premise itself, there’s no character or style to it, being an elaborate maze housing keycards and a single exit. When it does stand out, it’s for all of the wrong reasons. The keycards are such small objects that it’s easy to pick one up without realizing it. This is partly because collecting any item in the game causes the same sound effect to play. 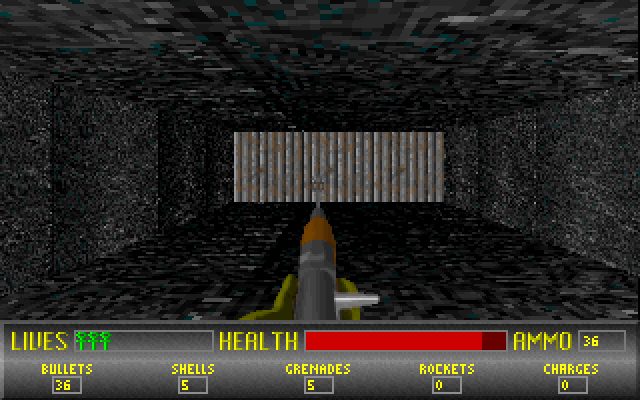 It’s not like Wolfenstein 3D in which each item type produces a unique sound effect. Rainmaker Software didn’t even have the courtesy to take cues from Doom and have messages display whenever you collect a new item. One of the absolute worst aspects of exploring stages in Nerves of Steel arises whenever you must deal with a teleporter. To begin with, they look exactly the same as an ordinary switch. The only way to discover the difference is by trial-and-error. In this case, the “error” portion of the equation potentially translates to placing your character in a middle of a room swarming with enemies. Because enemies always face the player, anyone capable of seeing your character will begin shooting. Even the pitiful damage their weapons inflict adds up if you’re in the center of a room with no cover to hide behind. Unsurprisingly, given this game’s track record, activating switches or teleporters is easier said than done. It requires standing in the exact right spot and pinpoint timing. Anything less and your action will either not register or flip the switch on and off in rapid succession. What elevates the teleporters from being minor annoyances to serious issues is that keeping in track of where they send you can be next to impossible. One of the very few areas in which Nerves of Steel could be said to be an improvement over Isle of the Dead is that the map is actually fairly useful. It does not show you a vague outline of the immediate area; one can actually use it to find their way in a given stage. The exception to this rule is if there is a plethora of teleporters in the stage. 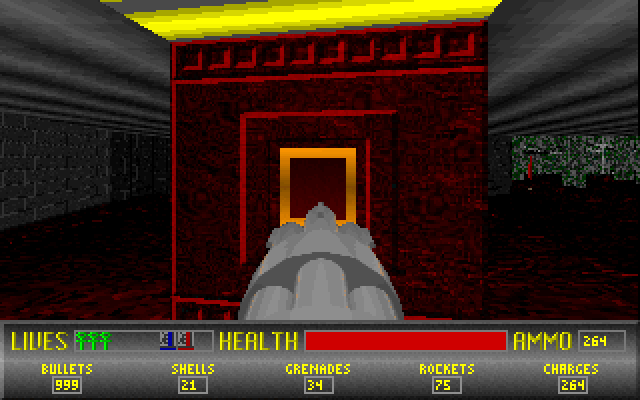 There are no fewer than two stages that place the player in a maze consisting of several rooms with a select number of teleporters on each wall. From here, players are made to find their way around. This proves to be a Sisyphean task because these rooms are nearly identical. Certain teleporters send your character back to the beginning of the stage. If that happens, you can’t double back; you must navigate the teleporters from square one. This isn’t challenging; it’s just a guessing game that punishes the player for not having extrasensory perception. This did lead to the single greatest moment in my playthrough, however. Not content with creating maze of teleporters, Rainmaker Software decided to make players go on a key hunt at the same time. When my frustration reached critical mass due to being unable to find the last keycard, I began mashing the spacebar in frustration. To my amazement, I found myself starting at the results screen; I had somehow bumbled my way into the end of the stage. I thought it a bit odd, for I didn’t find the exit tile, which is another texture that looks identical to a normal switch, incidentally. To prove my point, this is what the exit in the same stage as the switch pictured above looks like. I reloaded a save to see what I had done. Even with all the game had thrown at me, I couldn’t believe what just happened when I put all the pieces together. The exit switch is located on the other side of this yellow door. One needs the yellow keycard to open it. Said exit switch is located on the reverse side of this wall. When I began mashing the spacebar, this is where the game decided that I had completed the level. Are you starting to catch on to what happened? |That’s right – the programmers didn’t bother to make sure the player is on the correct side of the wall before activating a switch, teleporter, or exit.| I was thankful because it meant skipping a tedious stage, but it also demonstrates just how little the developers cared. If I were reviewing a standard terrible game, this is the moment in the review in which I would talk up the final encounter with Kim Dung Moon. I would say that the final boss is the last chance the game had to redeem itself. Because nobody by now would believe me for a second that this game has any chance of redemption, I’ll just state the obvious: the final boss is a complete disappointment. Admittedly, it’s not really a disappointment when you’re fully expecting it, but the only difference between him and his minions is that he has a slightly larger amount of health. If you equip the rocket launcher, the battle is over in about ten seconds. He doesn’t even leave a corpse behind; he merely fades away into nothingness. This caused me believe he could teleport, but it turns out he really is just that much of a pushover. When I was just about to win the game, one final bout of nonsense prevented me from reaching the goal. Despite having the red keycard to hand, hitting the spacebar did nothing. I proceeded to wander around the rest of the level wondering if there was anything I missed. I eventually learned that you have to be standing behind the wall to the left of the alcove containing the door to open it. Also, you have less than two seconds to go through the door before it closes again. This is what makes Nerves of Steel such a painfully horrendous experience; the developers make up their own logic before deciding they don’t feel like abiding by it. It may not have the dead-man-walking scenarios that defined Isle of the Dead, but Nerves of Steel is just as hostile to blind players as its spiritual predecessor. Speaking of Isle of the Dead, Nerves of Steel also has the audacity to end on an insipid sequel hook. Spoiler alert – there is no sequel to this game either. One would be hard-pressed to find a parody that ends with the words “OR IS IT?” Because such a reality never came to pass, I consider that the single highest note this game could’ve ended on. Making a game worse Isle of the Dead wasn’t an easy endeavor, but playing through Nerves of Steel from beginning to end convinced me that the staff members of Rainmaker Software were more than up for the task. Indeed, within the span of two games, they cemented themselves as one of the worst developers in the medium’s history. Perhaps big-name developers are responsible for a greater number of terrible games, but even their worst efforts at least had some sort of care go into them. If nothing else, even companies behind certain abysmal games had plenty of quality titles to balance out their slights. King’s Knight may have been one of the worst games of its era, but the company behind it, Square, rose above that and became a respected developer in the nineties. The goodwill was such that they had plenty of loyal fans even when they began stumbling in the early twenty-first century. This is not the case with Nerves of Steel. For every way in which it could be said to be an improvement over Isle of the Dead, Rainmaker Software made at least one-hundred more mistakes. They started at the absolute bottom of the barrel and somehow ended their short lifespan far below that nominal standard. That they had what amounted to an unstable pre-alpha build published can only be explained away as a transparent swindle intended to cheat fans of Wolfenstein 3D or Doom out of their hard-earned money. Suffice it to say that given the sheer obscurity of Nerves of Steel in the annals of gaming history, one could conclude they failed miserably. Even giving Rainmaker Software the benefit of the doubt by assuming they legitimately wanted to make a good game, there’s no getting around that Nerves of Steel had no business whatsoever existing on store shelves, let alone on one’s hard drive, for any reason. Like Isle of the Dead before it, Nerves of Steel was a product of a time in which the worst of the worst usually faded away from the public consciousness before it could do any substantial harm to the medium, and I deem that to be a fitting coda to its legacy. The name of this is familiar for some reason. Mercifully not because I’d ever played it! Oh? When did you hear of it? I learned of this game’s existence around the same time I played Isle of the Dead. I don’t know how, but as bad as Isle of the Dead is, Nerves of Steel is worse. Consider yourself lucky that you never played it. I’m not sure, it’s just a name that rings a bell for some reason. Maybe I heard it mentioned in relation to Isle of the Dead at some point. How did you even hear about this game?? Did you hear of it before my review? Never! It looks like one of those games that turned up in tiny plastic packaging (like Major Stryker) and promptly vanished. I’m surprised you remember it! Actually, this is a game I deliberately sought out for the sake of bashing; I had never heard of it before I played Isle of the Dead last year. 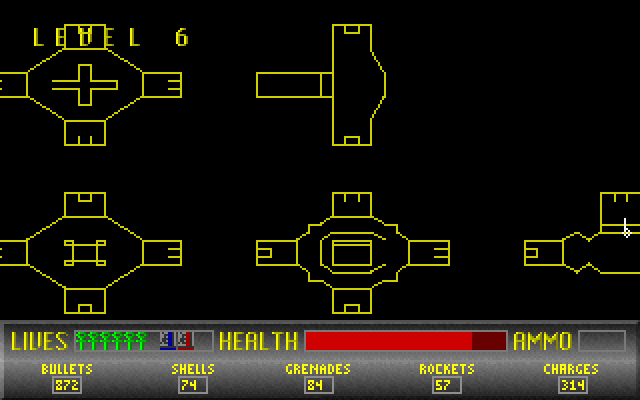 Getting it to run in DOSBox was quite difficult, but I found a way to make it (mostly) stable. Needless to say, it wouldn’t be worth the effort for most PC gamers. I liked how this review came out, so I’d say it was worth the aggravation – barely. It did! I think working through the experience chronologically worked well. Often I don’t like that structure but it worked well here – probably because it has such memorable opening and closing flaws. Thanks! I’m glad you liked this review. This is another case in which I’m glad I managed to convey that feeling in still images because I don’t even think watching somebody play the game properly signposts just how broken this game is. It’s probably for the best that this company went bust. Sounds like their team were lacking in terms of competent coders and level designers. The enemies have worse aim than a Storm Trooper. Yeah, they clearly didn’t have what it takes to remain in the business. Isle of the Dead was mostly stable, and if Nerves of Steel is any indication, that was likely a fluke. Both games do have appalling level design, so they were clearly deficient in that regard throughout their entire lifespan. This could probably serve as a great example of not to implement hitscan; enemies seem to have the same flat chance of hitting you regardless of distance and whether or not you’re moving at the time. They very well could’ve been the Digital Homicide of their day – the only difference is that they had the decency to drop off the radar screen when it was clear their strategy wasn’t working. That might well be the ugliest game I’ve seen. Those screenshots are hideous. And it sounds like the game itself was just as bad. It’s not often you can point to a company going out of business as an unadulteratedly good thing, but here, that seems to have just been the world settling back into how it’s supposed to be. Thank you for suffering through this game, so that I know I don’t have to bother. They say not to judge a book by its cover, but in this case, Nerves of Steel is as unwieldy as it is ugly. Given that the team clearly had a severe lack of competent coders and visionary level designers, it’s just as well the company folded after only two games; even other dire developers such as Data Design or Advance Communication Co. at least had the occasional shockingly decent game to their name. Rainmaker Software didn’t – they start and ended at a level that describing as “bottom of the barrel” would be a little too generous. You’re welcome! Even out of morbid curiosity, Nerves of Steel should be avoided at all costs; it doesn’t even have the courtesy to be funny about how bad it is like Ride to Hell: Retribution, though I have to admit it’s still not as bad as Dr. Jekyll and Mr. Hyde.